South Africa coach Richie Gray admits he has a "big decision" make over his future but has ruled out an immediate return to his native Scotland. Gray wants to coach Scotland one day but is looking at other options. 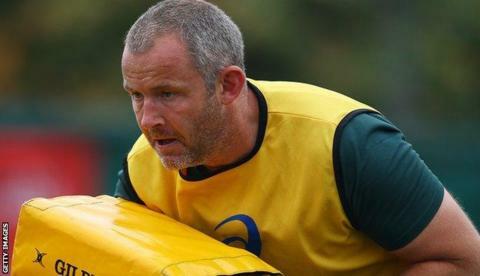 "Scotland's got itself sorted out at the moment," said Gray, who worked under the Springboks' then-head coach Heyneke Meyer at the World Cup. "All the coaches are in place. I think one more would muddy the waters slightly." Gray, who helped South Africa reach the semi-finals, told BBC Scotland's Sportsound: "I'll make a decision into the new year what I'm going to do. "I've got a big decision to make what I'm going to do next, but I'll definitely be coaching somewhere." Gray joined the South African coaching staff in 2013 as breakdown coach, but with Meyer leaving, Gray is contemplating a future elsewhere. "The head coach of South Africa resigned a couple of weeks ago," said Gray. "He decided not to put his name forward. "They've obviously had a discussion about what I would like to do as well. "I never really thought I'd stay longer than three years in South Africa. "Going backwards and forwards, it's been quite a commitment, especially with my family still back in Scotland. "There's two or three options on the table for me regarding clubs in England, France, there's also things in Japan going on. "I just love coaching. I coach because I want to make players better and you want to remain in the game. That's the two key things." Galashiels-born Gray has coached Scotland at youth level and admits he would like to be part of the international set-up at some point, but he says now is not the right time. "One day you want to coach your own country - I'd like to think that might happen," he added. "But, for me, I like to put myself into places that really challenge you, places where you're given no chance and you can come out and prove myself so I might continue to do that."